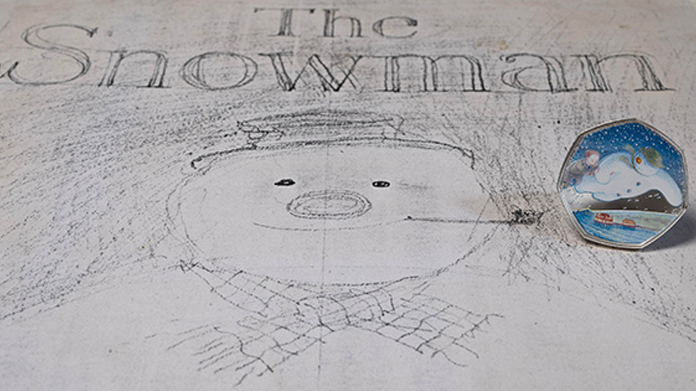 The Royal Mint team has been busy working on its latest coin launch, this time celebrating 40 years since the publication of the nation’s favourite Christmas tale, The Snowman. This launch follows a year of new launches from The Royal Mint team which have included partnerships with the team behind Beatrix Potter and the folk at Paddington. We’ve sold out the collections every time as we’ve helped establish a new gifting market for the brand and appeal to a new generation of coin lovers. This time it was the turn of a Raymond Briggs classic, brought to life on The Royal Mint’s latest 50 pence coin, featuring the iconic character flying over Brighton Pier. This was the first fully coloured coin by The Royal Mint so we wanted to do something special to showcase the superb design. We teamed up with Penguin to shoot assets of the coin next to Raymond Briggs’ stunning original illustrations – creating some truly beautiful imagery we knew the media and public would fall in love with. Print coverage in titles such as Metro and Daily Star were followed by a stream of online coverage on national sites including Daily Mail, Evening Standard, Daily Telegraph, which were quickly followed by lifestyle sites including Prima, Heat and House Beautiful. Following the raft of coverage we secured, people up and down the country were so keen to get their hands on the coins that they sold out within just three days. Nice.